SHARK VALLEY, Fla. — Biking the 15-mile Shark Valley loop in the Everglades National Park is probably something visitors and South Florida residents will do during the day, but biking the route under a full moon is an experience not many have the opportunity to try. The majority of visitors don’t know about this biking adventure, in fact. I didn’t, either, until University of Miami Photography Professor Tom Lopez suggested we plan a photo expedition. Click on the video at left to view an audio slideshow about moonlight bicycle riding at Everglades National Park’s Shark Valley area prepared by writer Valerie Lopez. We planned our trip based on the lunar calendar of December and found out full moon was scheduled for Sunday, but would also be visible during the previous two days. 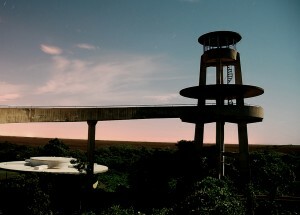 St right, the Shark Valley Observation Tower at dusk. 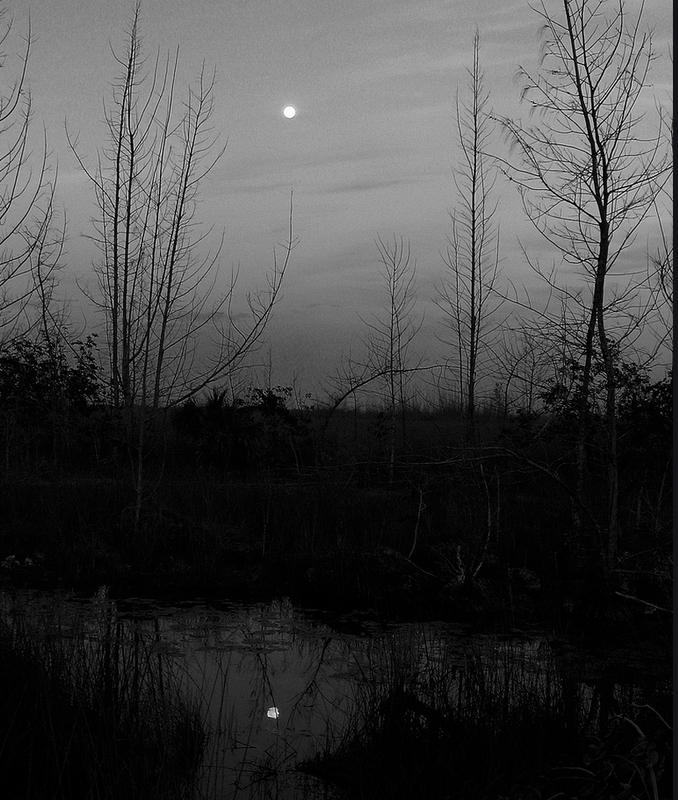 Below, the moon begins to rise over the park (Photos by Valerie Lopez). Since Lopez has been making this trip for more than five years, he let us know the only way this was possible is if we took our own bikes. The rental bicycles there are only available until sundown and there is no ranger supervision. He also emphasized that we pack water, snacks, lots of repellent, a flashlight, our photo equipment (camera, zoom lens and tripod) and a helmet. My three classmates, Mariana Espindola, Juan Fernandez, Matthew Evans, my friend Camilo Velasquez, Lopez’s wife Carol, Tom Lopez and I set up a meeting time and point: Dadeland Mall at 2 p.m.
V elasquez and I mounted our bikes on the rack of my Fiat 500 and headed to the meet up, from then on Tom would guide the journey. We arrived at 4:15 p.m. and parked on the Tamiami Trail since it’s the only way to access Shark Valley before sunset and stay to watch the full moon. We dismounted the bicycles and biked into the park, a big plus is that we didn’t have to pay to enter because the fee is issued per vehicle and Lopez also knew all about the park schedule. “I called the park ranger station a while back to ask what time the park closes but they told me that its open 24 hours and the parking lot is the only thing that closes,” explained Lopez. We were all very curious to know how our professor found out about this trip and he explained it was all a beautiful and gratifying accident. He came to see the sunset because it’s breathtaking from here and got caught up in a long distance phone call and stayed until after sunset and it became dark. “The sights, solitude and sounds were pretty incredible. 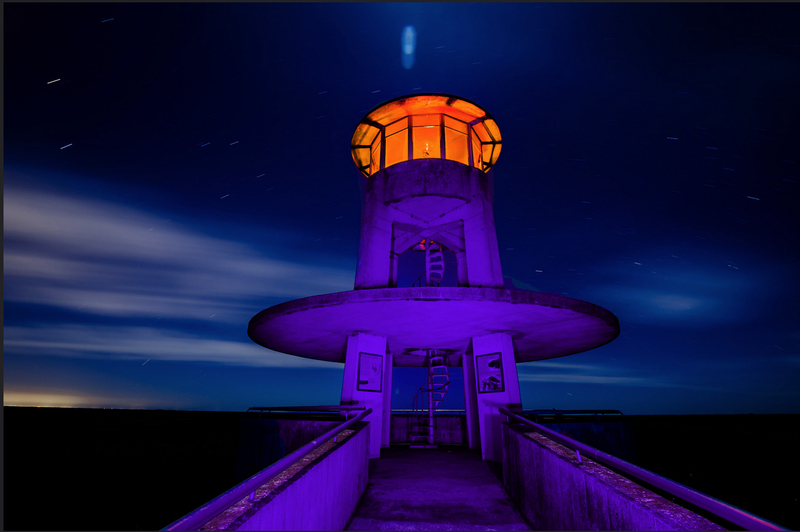 That day I didn’t bring my digital camera and it dawned on me that I could have tried light painting so my next trip I brought gels cut for some flashlights to produce different color effects,” shared Lopez. Since it was a photo expedition, each of us had in mind what we were looking for — long exposures that captured the beauty of the Everglades under a full moon and the starry sky. Tom had something else prepared for us too, we were going to try an old photo technique, photo painting, done in low light scenarios like this one with color gels. I had my tripod on the handlebars, my camera gear on my back and water and some snacks on the rack. 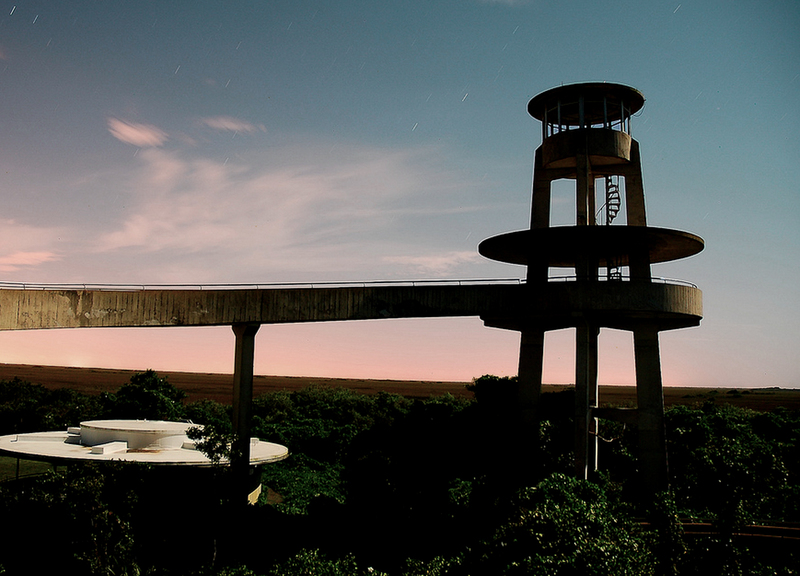 The group decided to take a steady and slow pace since we had time to enjoy the vivid scenery for a while before sunset at 6 p.m.
At right, the Shark Valley Observation Tower at night. 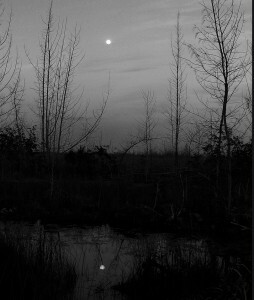 Below, moonlight illuminates cloud cover in the park. It took us around one hour to reach the Observation Tower, about eight miles, and half way along the loop trail. The weather was windy with no humidity, which made the ride more pleasant. It was worth the journey to see the amazing sunset over the Everglades. The sounds of the birds, frogs and alligators were as amazing as the view. As the sun was setting in the West, the full moon was rising in the East; we had a 180-degrees view. There they were, the alligators emerging darkly at the surface of the water, their scales looked sharp and tenebrous under the moonlight. We watched the sun vanished and took out our equipment; it was playtime for us. We set up our tripods on the location we wanted to shoot and set our cameras to the right exposures, ISOs and shutter speeds. First, I took some photos of the moon while rising, but since I didn’t have the correct length in the lens it was quite difficult to capture the moon perfectly. After some time shooting landscape photos of the area, Lopez explained the painting with light practice in detail. To have the correct photo, it takes some practice to match the exposure with the amount of light that comes in the lens and the light irradiated from the flashlights. The best was to capture an image was by using a wider aperture and longer exposures. It was a trial and error experiment, sometimes the color gel we used and the amount of light directed worked, some other times it was over exposed. We spent two hours playing around, eating our snacks and admiring so much beauty surrounding us until we decided to head back because it was getting late. 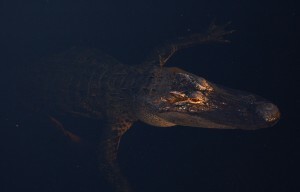 As we were going down the Observation Tower trail in the dark with our flashlights turned off, we heard an alligator smack the water near us. We all suspected it was going after some prey but it still scared us nearly to death. With an accelerated heartbeat, we got on our bikes and vanished into the blackness. We feared alligators, but realized mosquitoes were the true threat. We rode as fast as we could; I completely spaced, meditating in motion soaking in all of this magical experience. IMPORTANT: take water, insect repellent, sunblock and helmet. Visitor Center and parking lot hours: Daily, 8:30 a.m. to 5 p.m.